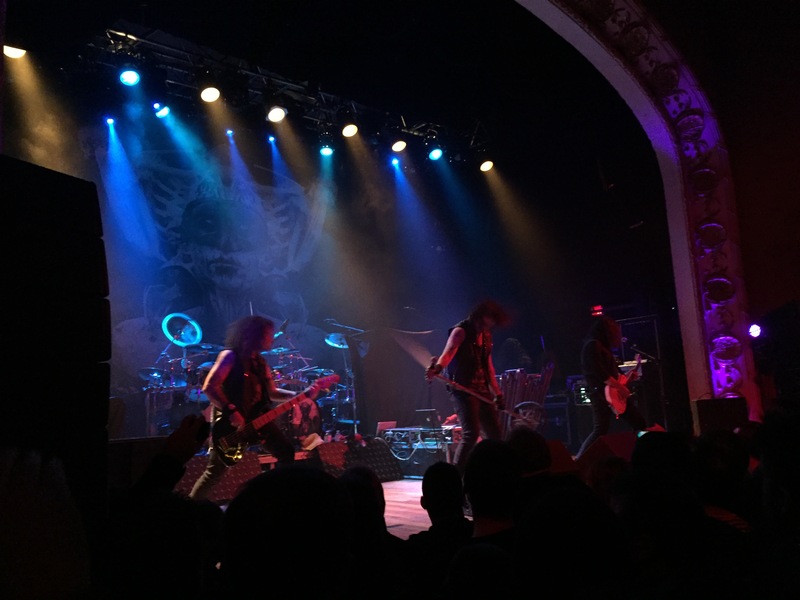 An electrifying fusion of Melodic Death Metal, Dark Metal and Symphonic Metal from distinct parts of the world storms the Opera House in Toronto in a memorable celebration of music. Although the winter hasn’t been too harsh so far in the city of Toronto this year, there’s nothing better than warming it up even more with some high-quality metal music from different parts of the world, all at the same place and time, don’t you agree? That’s what happened this Friday at the nice and cozy The Opera House, where fans could witness the riveting fusion of Melodic Death Metal from the United States, Dark Metal from Portugal and Symphonic Metal from the Netherlands on a cold but (thankfully) snowless night. And I was finally able to get a full concert in Toronto from the very first second, without missing anything, starting with the young and restless metallers from STARKILL. Still promoting their latest album, the good Virus of the Mind, from 2014, this talented American quartet distilled their Melodic Death Metal in a precise way, warming up the crowd for the main attractions yet to come. Lead singer/guitarist Parker Jameson and guitarist Tony Keathley seemed very comfortable on stage and also among the crowd right after their concert was over, having a few beers with their fans, therefore showing how humble these guys are too. Despite adding a couple of nice unreleased songs to their setlist (entitled Burn Your World and Cloudless), in my opinion they truly thrived with songs from their two studio albums, in special the excellent Be Dead or Die and Fires of Life. I just wish they had played a faster song such as “Breaking the Madness” or “Skyward” instead of Before Hope Fades to close the show, but that was just a minor detail in their solid overall performance. About 24 hours before the moon in the city transitioned from First Quarter to Full Moon, and after an interesting alternate version of La Bafomette working as an intro, the iconic Portuguese Dark Metal wolf pack MOONSPELL stormed the Opera House with their obscurity, heaviness, electricity and undisputed talent. I really don’t know what to say about their performance so perfect it was. Perhaps that it took me too long to watch those old school Gothic metallers live for the first time? Anyway, their live concert is so damn brilliant it feels like an enhanced version of their studio albums, especially the performance by frontman Fernando Ribeiro. There’s so much passion emanating from his voice, either through his deep clean vocals, through his powerful growls or through his “real-time poetry” (or even when he made a joke about the guys from Starkill being so young they could be his children), that it’s impossible not to get completely mesmerized and stunned by him during the entire show. Of course, the rest of the band contributes enormously to the perfection of their music, with highlights to the polished and soulful riffs and solos by guitarist Ricardo Amorim, and to the sinister notes by keyboardist Pedro Paixão. There’s an absolute attention to detail coming from each musician involved, turning the experience of seeing Moonspell live into something unique. In addition, when you have such a masterpiece like their 2015 album Extinct guiding the setlist, with incredible compositions like Breathe (Until We Are No More), Extinct and The Last of Us complementing their old classics Night Eternal, Opium, Vampiria and Full Moon Madness, it’s extremely easy to put a sincere smile on the faces of the fans that attended the concert. My only complaint is that their setlist was way too short and didn’t live up to their dark legacy. 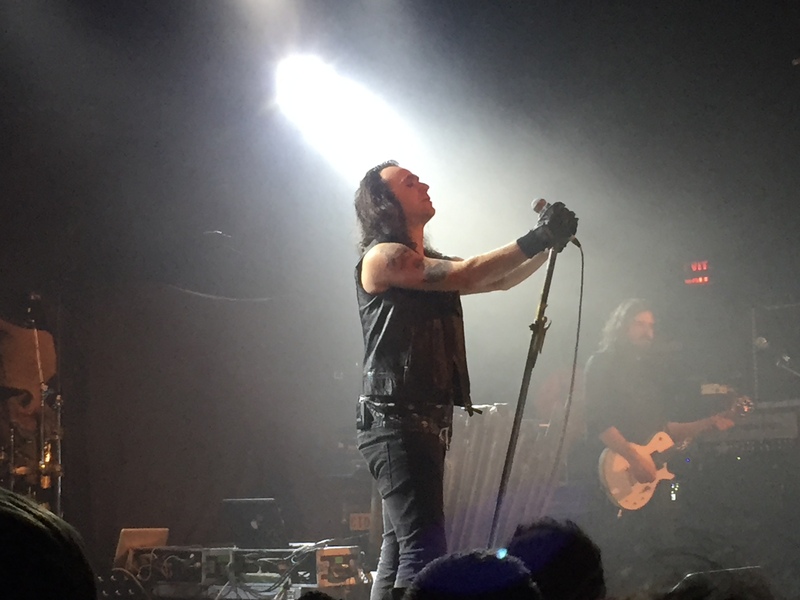 When the show was over after a little less than one hour, I was eager for more of their Gothic Metal, something you can expect from such an amazing band with a dazzling career like Moonspell. Well, they haven’t risen to stardom for no reason, right? If they had another 20 or 30 minutes to showcase more of their beautiful music, maybe by adding songs like “White Skies” and “Scorpion Flower” to their setlist, the night was going to be epic and, more important than that, more than eternal for us mere mortals. I cannot wait to see the “gajos” from Monspell live again, and next time, before the lights go out and before our time is gone, they better be the headliners or we riot! 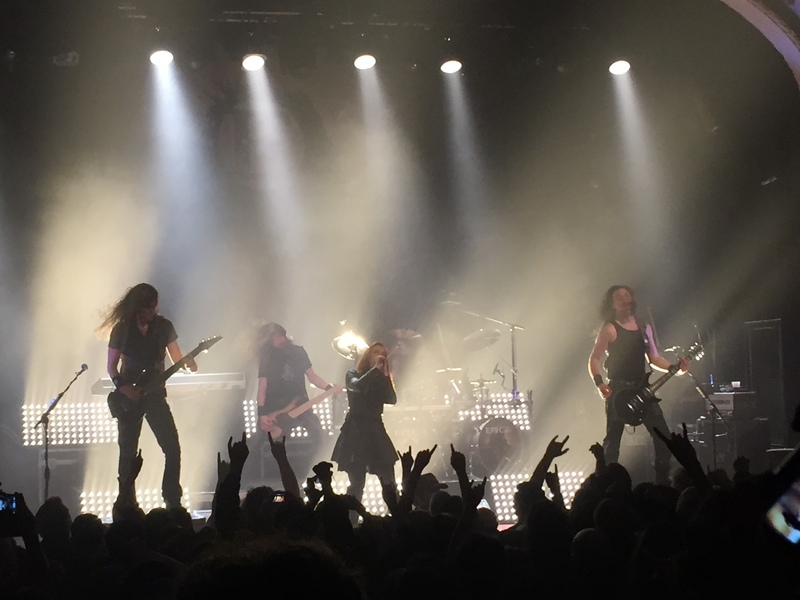 However, as most fans at the venue were there to see the main attraction of the night, the Dutch metallers from EPICA, I had to cope with the fact Moonspell’s concert was over and get ready for another good performance by the red-haired bombshell Simone Simons and her loyal crew. Due to personal reasons, they had to cancel their concerts in Toronto, Chicago and Minneapolis last September, which is why I believe their fans at the Opera House were so excited this Friday night. 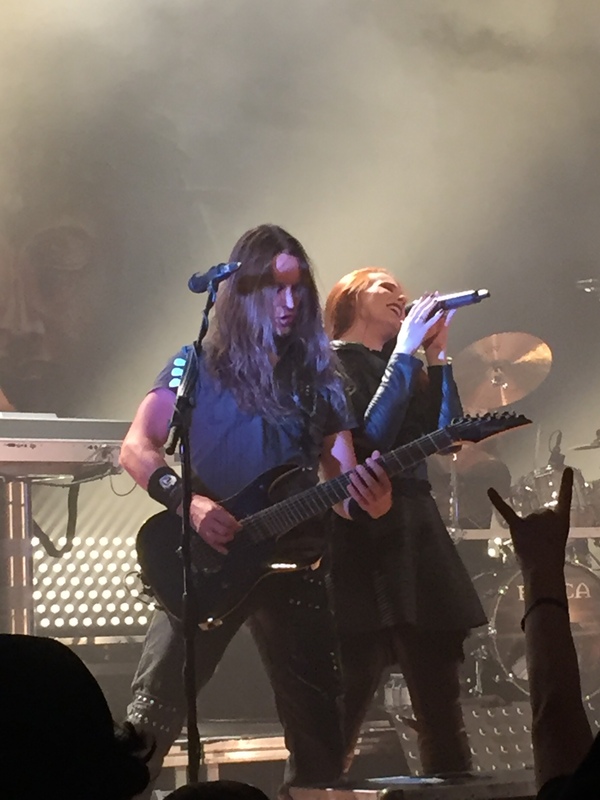 Blending old classics with newer songs from their 2014 album The Quantum Enigma, Epica captivated the hearts of most people at the venue, with Simone connecting every single moment with the fans. As it happened with Moonspell, songs like The Second Stone and The Essence of Silence, despite not being classics yet, set fire to the crowd and boosted even more the impact of their classics, creating a very positive atmosphere among the crowd. And what can I say about the weird keyboards by Coen Janssen? What the hell was that? I mean, it looks cheesy, but it ends up working well with the music. If you like Epica, you know what I’m talking about. 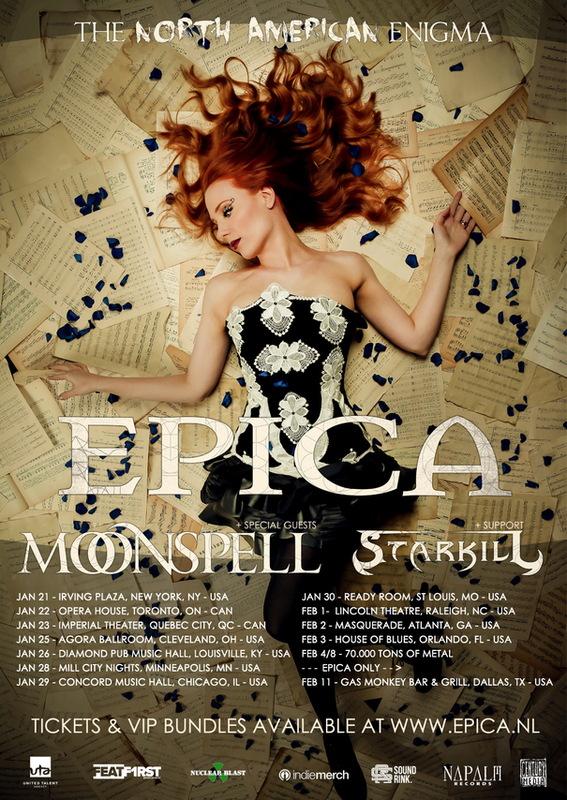 There was just one minor issue with Epica’s performance, that being Moonspell. Well, not actually Moonspell, but the quality of the sound by the Portuguese metallers was way above what Epica provided the fans, which in the end felt odd. Sometimes their music sounded a bit muffled or tangled, not as clean as their studio versions, with Simone’s voice sounding lower (and almost inaudible in some moments) than all instruments. Nothing that could diminish the excitement among the fans at the venue, though, and obviously nothing that would make the night less memorable. If that mix of different subgenres of heavy music from distinct countries will ever happen again, only time will tell. In the meantime, all that’s left for us is keep those good moments deep in our hearts and wait until these bands come back to Toronto (especially Moonspell, in my case) for another shot of top-notch Heavy Metal.